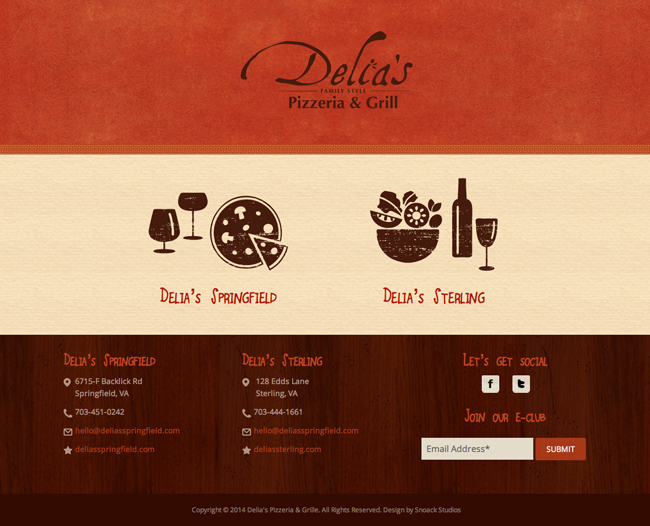 Delia’s Pizzeria is located in Springfield and Sterling, Virginia and serves delicious award winning pizza. We created a new website design for them that has a landing page for both locations and directs customers to the location of their choice for more information. Each location’s website has a menu and catering information, as well as reservation and contact info. The website features lots of rich textures and has a very warm, homey feel. We chose a few fun and playful fonts that tie together the design and bring out the fun nature of the restaurant, showing what the experience of the restaurant is like. We added some hand drawn elements to the design that also echo the homemade, family-friendly experience.